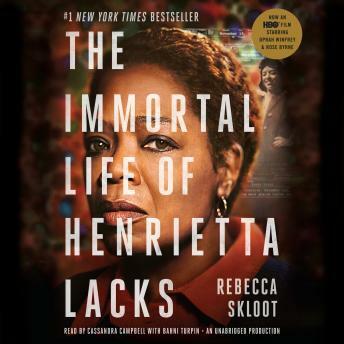 Listen to "The Immortal Life of Henrietta Lacks" on your iOS and Android device. The medical community showed very little compassion for Henrietta or her familiy. I'm not convinced this situation has changed when it comes to medical research. I can only hope the racist aspects have improved. Well researched and written. This is one of the most profoundly moving stories I have ever read. The story is disturbing at times and so very tragic for the most part. The narrator was fantastic and helped me get through the more difficult subject matter. It is a story worth listening to and will stay with me for a long time. I don't even know where to start about this book. It is like "Roots" for human HeLa cell culture, but it's also about Henrietta Lacks and her family. This book took TEN YEARS to write. Wow. The end of the audiobook included an interview with Rebecca Skloot, the author of the book. Although you could tell that Rebecca got close to Henrietta's daughter, Deborah in the book, it came through in the warmth of Rebecca's voice during the interview. The original idea may have been who is the woman behind the HeLa cells, but it became much more. This is a great audiobook! I enjoyed how the author went in-depth on the family story as well as the history human cells and the research work. The book really showed the struggles and dilemmas from various perspectives. Thoroughly enjoyed the voice narratives and how it drew me into the story. Fantastic audiobook. Rebecca went over and beyond to gather information about Henrietta and the family. So much that I was unaware about until I heard the history about HELA. This was an amazing tribute to the Lacks family and it was so informative. I enjoyed every moment of the narration and format in which the story was told. I hope that this is a story that will be instituted in the high schools for students to learn more about the very interesting build and outcome of this story. Amazing absolutely amazing to caputure not only the scientific points but to include where this amazing scientific and medical research breakthrough originated from. Great work! Very educational story, well researched and documented. Interesting and different. This is a wow story for anyone who hasn't read this story. Very interesting that the story was real biography, and a non-fiction. I would recommend this book to others. Narrator was very good, talking the different accents of the different ethnic groups. Very well done, as if I was right there with them in Clover, Baltimore, VA, and in those decades around 1950's to 1970's. This book is written so brilliantly and easy to understand. Ms. Rebecca put her heart and soul in this book. Love this, this should be read in Junior High School . History, Science, medical history, black history, cancer, polio, HPV studies and cures. Thank you Henrietta, Debra and Rebecca! Very interesting I couldn't set it down. I loved this book! !